If there's one thing I love to see, it's PC indie game getting the chance to find a whole new audience on consoles. Next week (and just in time for Valentine's Day, all you co-op lovers out there) Nerdook's Vertical Drop Heroes HD will make its way onto the PlayStation 4 (and Vita), and onto the Xbox One a few days later. The last we heard from Nerdook and Vertical Drop Heroes HD, the one-man development team had just wrapped up converting the game from a browser-based Flash game to a full-fledged PC title. Since then, he's been busy working on bringing the action RPG game to the current gen consoles, a venue that feels pretty appropriate for it as it's a fun/quick pick-up-and-play co-op title. Just as on the PC, the PlayStation 4 and Xbox One versions of the game will support two player couch co-op. 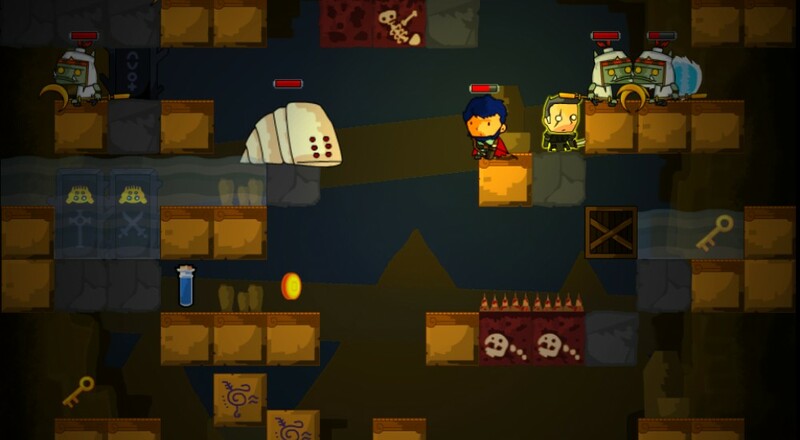 Vertical Drop Heroes will be available on the PlayStation 4 and PlayStation Vita (NOTE: it is not clear at this time if the Vita will support co-op via AdHoc play) on February 14, 2017, and on the Xbox One on February 17. The title supports the "Cross Buy" feature for PS4/Vita, so picking it up on one platform automatically allows you to get it on the other. The game will retail for $6.99 on PS4 and Vita, and $7.99 on Xbox One. Page created in 0.6820 seconds.